NASA-NOAA's Suomi NPP passed over strengthening Hurricane Florence in the Atlantic Ocean and observed powerful thunderstorms within a more organized storm. Florence became the Atlantic Ocean's third hurricane of the season on Sept. 4 at 11 a.m. EDT and continued to strengthen in the season's first major hurricane at 8:35 a.m. EDT on Sept. 5. On Sept. 5 at 1:06 a.m. EDT (0506 UTC) the Visible Infrared Imaging Radiometer Suite (VIIRS) instrument aboard NASA-NOAA's Suomi NPP satellite captured an infrared image of Hurricane Florence. 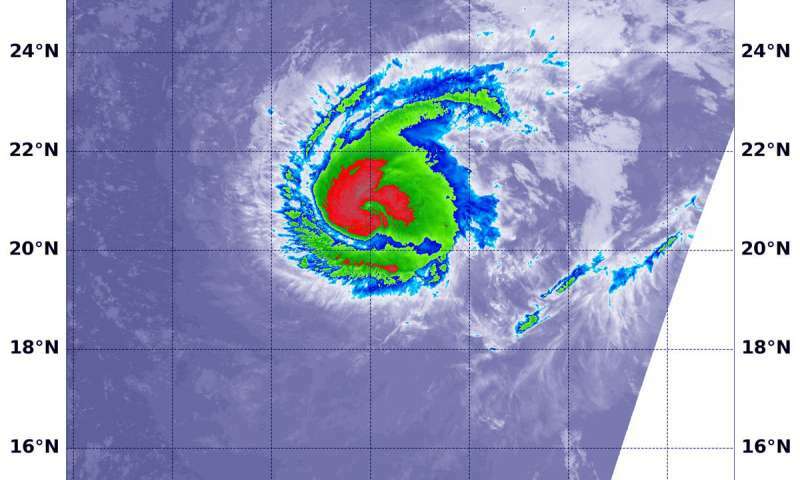 On Sept. 5 at 8:35 a.m. EDT (0900 UTC), the center of Hurricane Florence was located near latitude 21.7 degrees north and longitude 45.2 degrees west. That's 1,185 miles (1,910 km) east-northeast of the Northern Leeward Islands. Florence is temporarily moving toward the northwest near 13 mph (20 kph). A turn back toward the west-northwest is expected later today, and this general motion is expected to continue with Florence's forward speed decreasing by the weekend.